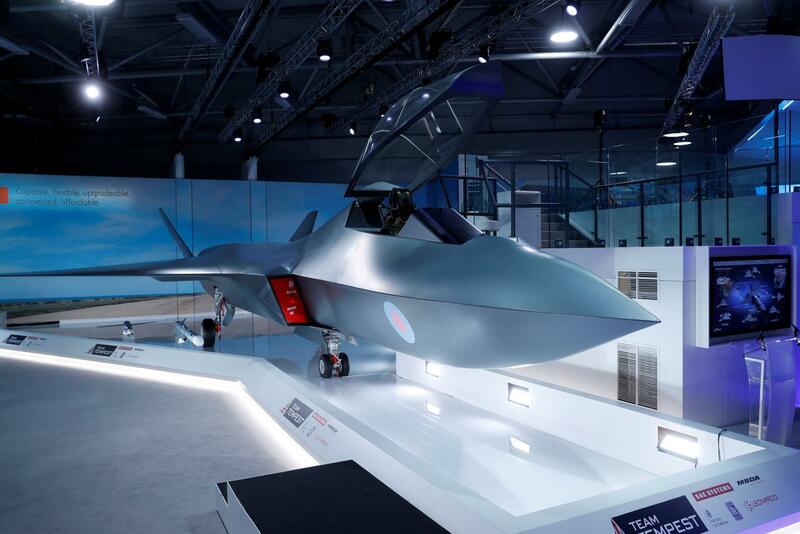 On 19 March Team Tempest and RAF Command briefed over 300 industry and Government attendees at the Farnborough International Exhibition & Conference Centre. The event was held to give UK industry the first substantive insight into the work of the Team Tempest partners (BAE Systems, Rolls Royce, Leonardo, and MBDA supported by MoD) and RAF Command. RAF seniors briefed attendees on the intention, scope and timelines of the MoD’s Combat Air Strategy, as well as how Team Tempest and other research and development (R&D) and innovation work fits into the UK’s combat air future. Team Tempest members briefed on their programmes of work, and how synergies are being sought between the programmes to aide the integration of various technologies into a future system. At this very early stage in the decades-long programme of work it is important to clarify the distinctions and differences between the work being undertaken by Team Tempest and that of MoD. The more immediate innovation work and business opportunities will be delivered by Team Tempest; whereas it is clear that MoD, and specifically RAF Command, is doing much work to ensure any new capability is coherent with the future fleet and information landscape that the MoD will operate from 2030 onwards. The briefings received by industry set out an ambitious, but achievable timescale for R&D, innovation work and most importantly culture shift in the coming decade. All presentations spoke to the need to approach the Future Combat Air (FCAS) programme in a vastly different way to previous programmes of such national significance. All elements such as procurement and commercial models, international partnering and joint export strategies, and skills development and retention will require a cultural shift that will take years to implement. The successful delivery of this programme will depend on very close alignment between the FCAS programme and the separate Combat Air Acquisition Programme being established between MoD Main Building and Defence Equipment & Support (DE&S). As R&D programmes progress through the Technology Readiness Levels it will be increasingly important for the procurement and commercial models to be in place and contain enough agility to avoid the ‘valley of death’ (the point in the transition from R&D to procurement where many project fail to gain a senior sponsor and achieve pull-through to service). Given the future system will heavily rely on fast-moving technologies such as digital processing it is vital that processes match pace with technology. ADS will continue to work with Team Tempest, MoD and our members to support the development of these programmes. If you are looking to find out more about potentially working with the industry members of Team Tempest please visit the Tempest Programme within our Business Development Centre.